This carpet transition strip is perfect for your glued down carpet to tile transition or other resilient flooring. 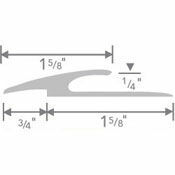 The rubber carpet transition strip has a 1/4" undercut and transitions over a 1 5/8" span for a smooth carpet to tile transition down to 1/8" resilient flooring. See detail picture at the bottom of this page. Also find carpet transition strips in 7 popular color shades. The actual color for the carpet to tile transition piece may differ from what is seen below due to your computer screen settings. 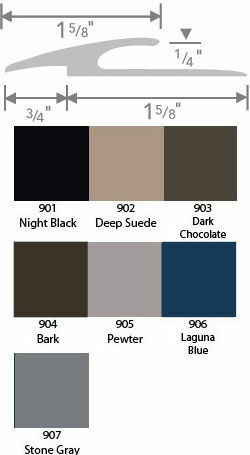 Contact us with any questions regarding color. Regardless if the carpet transition strip is used to connect tile, cork, linoleum, vinyl, or rubber, you'll find a connection that will stand up to traffic even in high foot use areas. 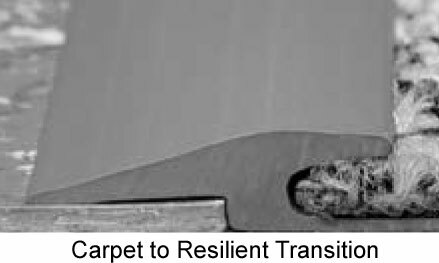 This carpet to tile transition (or other resilient flooring) has been approved by the American Disabilities Act (ACT). The carpet transition strip is a single molded piece guaranteeing a smooth shift between 2 different flooring heights. Carpet to tile transition from 5/16" to 1/8"
Attach the carpet transition strip securely with Transition Adhesive. When securing a carpet to tile transition, adhesive will give you a firm, smooth, stable connection that can be used in high traffic areas. Order this carpet to tile transition along with the above adhesive to complete your flooring project.